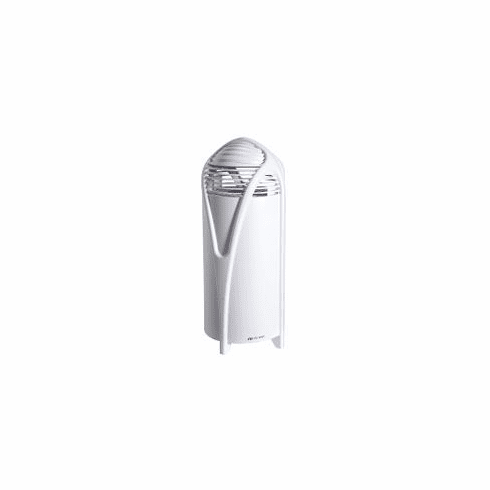 The Airfree T800 air sterilizer uses heat naturally to clean and freshen the air in your home. Independently tested around the globe, the patented Thermodynamic Sterilizing System (TSS) technology utilizes high sterilizing temperatures to destroy all organic particles passing through the unit. So, pollen, dust mites, dander, tobacco smoke, bacteria and other microorganisms are eliminated with 100% efficiency. The sterilization process of the T800 is eco friendly with no ozone, UV or other hazardous emissions. The Airfree T800 is compact and lightweight at only 1.5-lbs making it the perfect air sterilizer for your bathroom, bedroom, RV/boat, or any area up to 180 sq. ft. The T800 operates silently and uses very little energy because there are no filters or moving parts with the TSS technology; which also translates to no extra costs associated with this air sterilizer. The Airfree T800 is also maintenance free, requiring only an occasional surface cleaning of the outer plastic housing. The Airfree T800 works as contaminated air is drawn into the bottom of the unit via silent air convection. The air passes through the patented ceramic core sterilizing chamber where harmful pollutants are incinerated at temperatures up to 400°F. Clean air then passes through a cooling chamber and exits out of the top of the unit. The T800 remains cool to the touch and there are no significant changes to the temperature or humidity of the room. The Airfree T800 has a 2-year limited warranty ensuring that it will be free from all material and workmanship defects for 2 years from the date of purchase.